iPhone 3g included USB cable starting to tear apart | When Will Apple? UPDATE They replaced the cable for me! 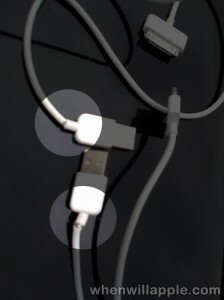 I just noticed that the USB cable that was included with my iPhone 3g is starting to tear apart. My friend is having the same exact issue which you can see in the picture to the right. Both of the cables have the tear in the same exact place. I guess since this cable was made along with the recalled plug, there might be an overall quality issue. Because the risk of electrical shock is probably not an issue with the cable I doubt we will see this recalled. My friend was not able to have their cable exchanged at a local apple retail store because they said it looked like user damage and not covered under the warranty. Luckily for now it’s still working, but who knows for how long. I’ll update this thread after I try to exchange my cable at the same apple store. Well I went to the grand opening of the latest apple store in Miami at Dadeland Mall and they returned it without hesitation! Not sure if they were just trying to be extra nice since it was a store opening or if my friend just got a “special” employee at the other apple store. One thing to note is it was replaced with a regular iPod cable, the one you squeeze to unlock from the device. This was fine for me as I believe the 3g one was the source of the problem. I will be using this one the same as the old one and will see how it holds up 2-3 months from now. Thanks for your feedback, but do you have an iPhone 3g cable? All my other USB cables from apple have been fine just like yours. I’ve never heard or seen this happen to anyone before getting the iPhone 3g. The fact that the USB plug attachment that came with the iPhone 3g was recalled leads me to believe that it is just an overall quality issue. 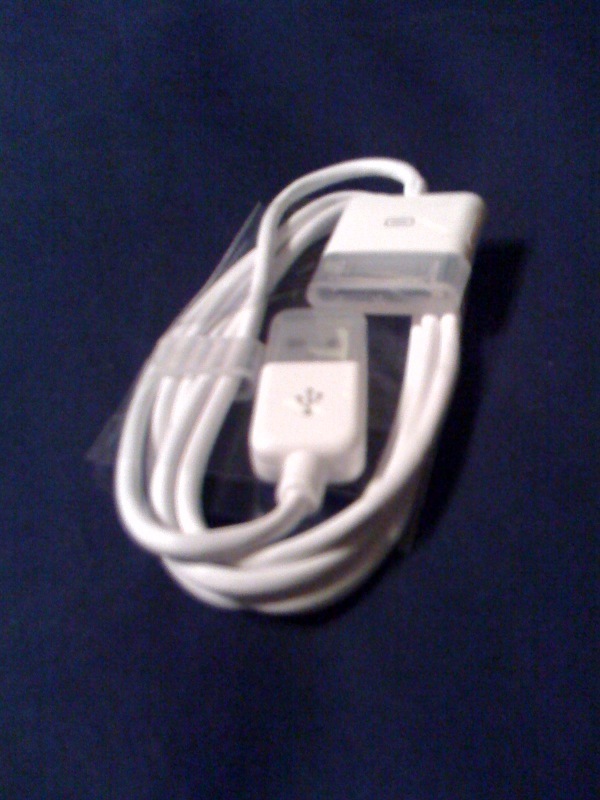 I got this too, and ONLY on my iPhone 3G USB cable. I put some electrical tape around it to avoid the wire being out in the open. anon sounds like a douche. I agree with you, I have the EXACT same problem. Luckily I’ve heard of our Apple store exchanging it. I take very good care of my equipment. I think the cord coming apart has something to do with it’s very short length. When plugged as a wall unit, it’s hardly long enough to reach a table top to be placed on. I’ve also read about this problem too. I know it is the perfect length for desktop/laptop charge but I know I’m not around those two 24/7. I’ve decided after exchanging mine for a new cable, I will get an extension cord to charge it or get a USB extension. I use my cables and they are NOT like that. I’ve a 3g cable! Mine’s like this too. I have an older one which is pretty beaten on, but the end has not separated. I have 2 iphone 3G’s one for me and the wife, and both of ours are doing the same exact thing. I just made an appointment at the apple store I’ll see what they’ll do. It appears to be a very common problem with a lot of the people i have talked to. It is not because we treat our stuff like garbage, like some ignorant user suggested. It seems like with the price going down so did the quality of the cable. I guess they’re trying to cut cost every where they can. Yep, same problem here. I agree that the cable is unusually short since it doubles as a sync AND a charger cable. That is certainly an issue causing the tearing. And having to use it as both means having to transport it (at least for me) to work and back. Yes, I’ve purchased a second cable for the office, but it has issues as well. I’m a soldier and my cables see heavy use, small pocket storage ect. and have all torn. Heavy duty electrical tape with a clean and careful wrap from the plug portion down about 2 inches has worked well for me. Do this to a new cable and it will last a long long time. Be warned, a half effort job here does NOT pay off. Be very careful to wrap it clean, tight and not too thick. This ga happened to me also. I’m on my second cord. The first one they exchanged for me for free. I don’t treat my iPhone any differently than any other phone I’ve ever had, and this has never happened to me In The past. I’ve had an 3G and 3GS since they were released and this has happened to EVERY (Apple) cable I’ve had. I’ve literally lost count and got to the stage of really resenting Apple about this issue. What bugs me is that they surely must know about this (just look at this web page alone), not to mention ALL my friends with iPhones HAVE THIS EXACT SAME ISSUE!! …. therefore it’s not illogical to presume that Apple employees also have this issue – ok maybe they don’t have to pay some ridiculous price for a replacement. the point is that I can just about forgive a company for bad quality products, just about, – if that company was not seemingly a “quality product premium price” brand. therefore, as consumers I put it out there that we should leave this “quality product” myth in the past, and forgive ourselves for believing and buying into this illusion. it’s because of this unconditional apple fan type of customer that this company has become smug enough with this issue. I mean my first cable has this issue years ago…..
do they do it for the revenue of selling replacement cables? do they do it because a company as large as Apple somehow is too dumb to manufacture (or to arrange the manufacture) of……. a wire!!!!? I cannot see it is any other of these 2 options, either way the company reeks of arrogance, that this kind of policy wouldn’t even dent their bs quality product brand image. feel free to distribute the following picture, taken in a well lit room, on a 3GS camera, manufactured at such time that mobile camera tech was held back by apple from this product, giving me the consumer reason to (need?) to purchase an iPhone 4 – presumably with a piece of junk charge cable..
it’s about time Apple had 1 iota of respect for it’s customer base. let’s not get carries away here about someones idea a few posts back – having to be delicate with a wire!!!!! We have three 3G phones, and all of our cables have come apart. We have repaired them so they work fine but are now bulky and ugly.